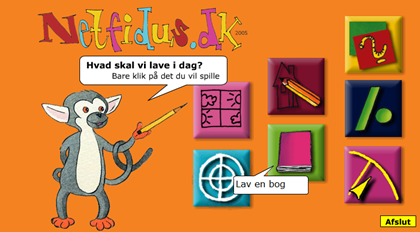 Online education: Netfidus.dk _ Mathias Vestergaard Corp. In 2001 when online-learning was still a relatively new and unexploited format, Jakob Lave from the publishing house approached me with an idea: he wanted a simple and intuitive, Flash-based interface where young students could play around in a creative way. I was just 16 at the time and I was thrilled to be involved in this project. The first version of the system was launched in 2002. The features included a cartoon designer, where the user can actually design little comic strips by dragging around pre-made illustrations on the screen, a memory game, a wheel of fortune game, a syllable game and an action packed “shoot the flying letters” game. Later, a book designer and a puzzle game were also added. Today, the technology has been upgraded to support more users and more data production (ASP->ASP.NET and MS Access->MS SQL). New applications were added, however, the system basically remained the same. This entry was filed under E-learning, IT - Information Technology, Websites.